Selma’s Dolls are adorable ragdolls created by Valerie Alva-Ruiz in partnership with fellow mom Courtney Stillwagon to mirror the beauty within every religion, culture and physical and mental disability. The debut collection of Selma’s Dolls ($39.99) features ragdolls Annie, Lola and Ameena. The dolls are made for children ages two and up as a way to introduce the beauty of differences through play. Via the storybook, parents can teach their children that differences are special and lead to friendship and understanding. It’s ultimately those differences lead to wonder and acceptance. 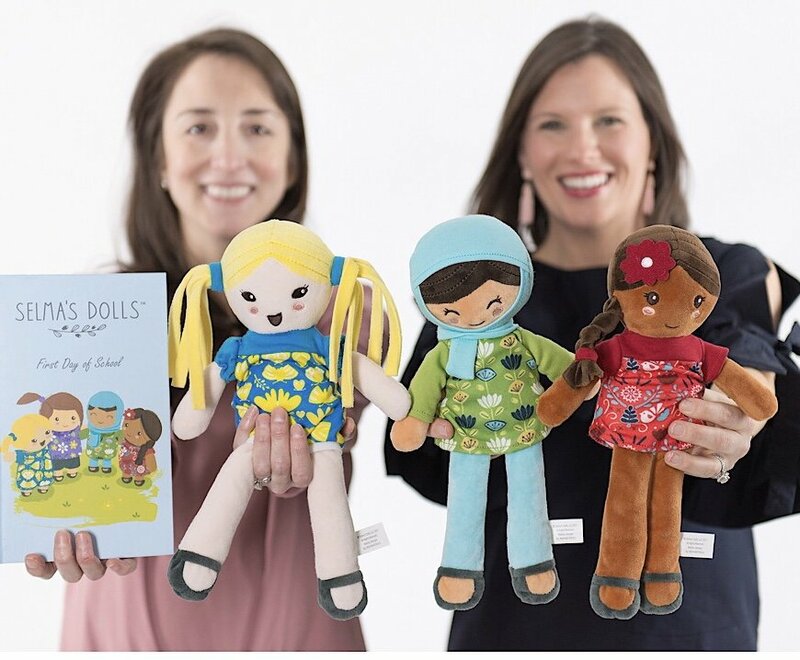 The mompreneurs behind Selma’s Dolls were corporate colleagues in Atlanta, GA. As they chatted about their young children and the importance of teaching them the importance of embracing diversity, they realized there was a gap in the toy market to help parents do just that. They decided to start their own company (while keeping their day jobs!) with the mission of teaching children to love, appreciate and embrace differences. They worked quickly, hiring plush industrial designers and creating rounds of prototypes to perfect color, texture, size and safety specifications. Recently creators Valerie Alva-Ruiz and Courtney Stillwagon discussed co-founding Selma’s Dolls together, their hopes for the company’s future, and more via an exclusive interview. Selma’s Dolls feature characters of different races and beliefs. Meagan Meehan (MM): The Selma Dolls are really cute! What made you decide to feature these particular characters? Courtney Stillwagon (CS): Thank you! We started with a large list of dolls we initially wanted to make. However, because we’re a start-up we had to take finances into consideration and it didn’t make sense to start a line of fifteen dolls. So, we decided to focus on the areas we saw as most underserved in the current doll market and we wanted to be sure we represented different cultures, religions and physical/mental disabilities. MM: Lola is Mexican and Ameena is Muslim. These are two groups that have faced a lot of problems in America recently. Did you intentionally make these dolls those cultures to help promote acceptance? Valerie Alva-Ruiz (VAR): Yes – all of the dolls were created to promote acceptance. It’s what our brand is all about. Representing the Mexican culture was important for me personally to honor my Mexican heritage (my parents are immigrants from Mexico City) and my daughter, Selma – the inspiration behind Selma’s Dolls – is half Mexican, too. CS: And I have a very dear friend who told me that she never bought her Muslim daughter a doll because she could never find a doll that represented her. That certainly motivated me to make sure that community was represented. MM: Annie has Down syndrome, so what was it like to base a character and a doll on a person with this condition? CS: I think we were more intentional with the physical appearance of Annie than any of the other dolls. It was so important to us to really serve the Down syndrome community by creating a doll that made you feel the love of a person with Down syndrome. If you look at the current market of dolls that represent a person with Down syndrome, there are a few dolls that succeed at capturing the anatomical characteristics. But what we wanted to do was capture the spirit of a child with Down syndrome. We really tried to make sure that when you held the Annie doll and read about Annie that you felt her huge heart and her friendliness – just like when you interact with a child with Down syndrome. MM: What were the challenges of getting the toys produced and into stores? VAR: There are probably too many to list! Courtney and I were (and still are) true novices in this entire process. Every step of the way was a learning process for us. We were (and are still) also juggling small children and corporate jobs. We were incredibly fortunate to have mentors along the way and a ton of encouragement from family and friends. One of the biggest challenges we had was importing the dolls. Just days before we needed to have the dolls shipped from the manufacturer, we learned we needed an expeditor – and we didn’t even know what that was. Ha! But we did the only thing we knew to do – Google – and start asking tons of questions. 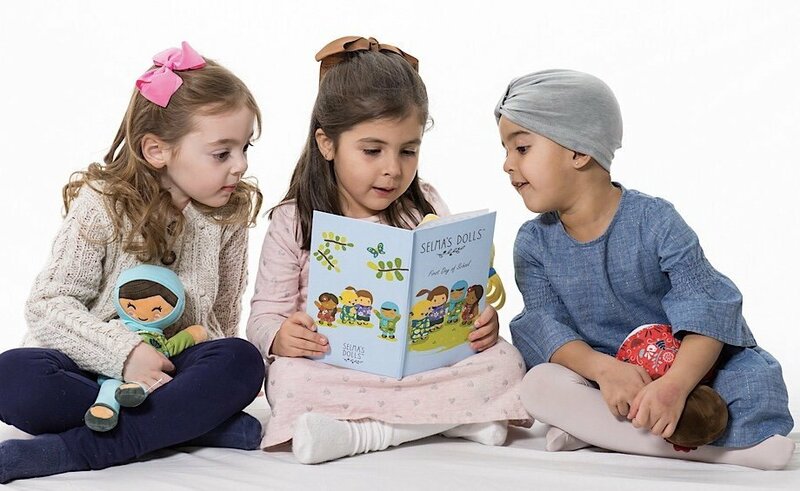 MM: The dolls come with a cute storybook that features words in Arabic and Spanish. How long did it take to write this book and might you make more in the future? VAR: The book took a few months to write and we spent a lot of time vetting it with members of each community we were representing. It was important for us to make sure we were presenting cultures, religions and physical/mental disabilities in an authentic, beautiful and respectful way. I speak Spanish fluently and it was really fun to learn a few Arabic words in the process! And yes, we would love to write more books in the future – there’s so many fun storylines we have in the works. CS: I’m not sure I have one that has been most memorable because I get giddy anytime someone says they were touched by the dolls, or that their child only wants to take Annie, Ameena, or Lola to the store. When we set out to create this, we said we would be successful if we could impact just one person (don’t tell our investor that), and when things get stressful I always go back to the stories we have of people who were inspired to talk to their child about the beauty of everyone. And so, we keep hustling! VAR: Agree with Courtney. It’s pictures or videos we receive from fans – of seeing how one of these dolls can impact a child or family in such a positive way that keeps us going. Not to sound like a complete sap, but it’s really one of the most rewarding feelings I’ve experienced! MM: Overall, what are your biggest goals for the future of the Selma Dolls line? For instance, what culture might you feature next? CS: We’d love for Selma’s Dolls to be known as a brand that’s all about acceptance and love. We would love to create additional lines of dolls in the future and have a mile-long list of communities we’re planning to represent. Right now, though, we’re focused on making this first line successful! Selma’s Dolls can be followed via Facebook and Instagram. Selma’s Dolls come with a story book, but they promote creative play.